The kids started helping me make it, but they scampered off in the middle of the process, & I really could have used the extra hands since I discovered the bowl I was trying to mix it in was too small, so mine isn't perfect, but for a first attempt I think I did a pretty good job, & it still tastes awesome. 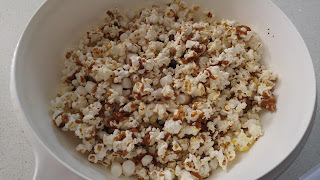 Basically cook as much popcorn as you want and pick out the unpopped kernels. Then on the stove take 1/2 cup butter to 1 cup brown sugar and put it in a pot and babysit it the whole time on med stirring it the whole time. you can dip a spoon in and touch it to the counter and let it cool, should be brittle and break not chewy. oh before you start that concoction though you should have about 1 cup semi sweet chocochips, a big pinch or two of salt, about 3/4 cup ruff chopped almonds and 1.5 cups mini marshmallows. 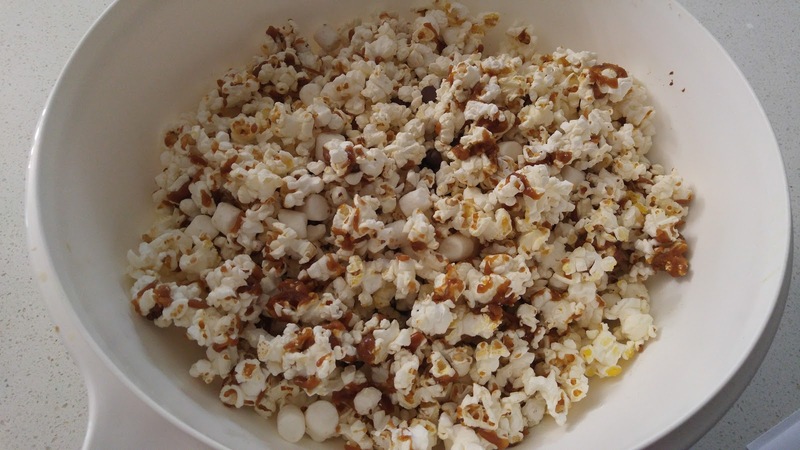 Basically when the caramel is ready you have to pour it on the popcorn, then almonds, then salt evenly, then marshmallows and finally the cocoa chips, without over mixing and making it look like poo. Pastor Chad (PChad) - married in '99, he keeps moving, & I keep following him! We've had lots of laughs & a TON of adventures! born June 2006, ALWAYS on the move. He loves Lego, climbing trees, & reading! born Aug 2008, quite the little comedian, who always has a smile! She enjoys reading, singing, & playing with her friends!